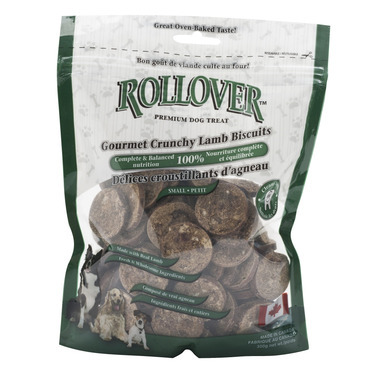 Rollover Gourmet Crunchy Biscuits are an all natural, preservative free biscuit for dogs. It consists of an irresistible combination of real meat, whole grains, vitamins and minerals that dogs can’t resist! The unique hard crunchy texture aids in the removal of plaque and tartar for healthy teeth and gums. These biscuits are nutritionally balanced making them a very healthy snack choice for your dog. Feed one crunchy after each meal to help reduce plaque & tartar build up. Ingredients: Lamb (liver, lung, heart & kidney) whole wheat flour, egg, sucrose, long grain rice, salts, whey protein, vitamin supplements (D3, B1, B2, B6, B12, C) folic acid, biotin, choline, trace minerals (calcium, manganese, zinc, iron, copper). I love the all natural composition of these treats and my Shih Poo absolutely adores them. She sits and waits for the delivery box to be opened hoping there is something for her. A good size for her. Ideal treat size for on the go dogs, all flavours appeal to our dogs. No preservative and all natural is important. Our dogs highly recommend this product.